....High risk construction work remains a major concern of OSHA and state-related agencies. Since OSHA's establishment, workplace fatalities have been cut by half, and injury/illness rates are at a record low - but not in the construction industry. ....Inexperienced workers, temporary assignments, and high turnover rates are a few of the reasons for the construction industry's difficulties with safety measures. 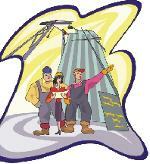 ....The most difficult aspect for safety on construction sites is coordinating all activities. Everyone must realize that other workers are in the area. Developing an overall plan for each activity and how task groups will interact is critical to accomplishing a zero accident program. ....OSHA recognizes the need for improved education regarding compliance and has partnered with state agencies to provide free consulting services to small companies. The consultation services serve as part of a team that prepares the job site and trains workers, ultimately guaranteeing that the workplace will pass on OSHA inspection. For more information, contact PWCE at 1-800-990-7923 or click here. ....The door is opening to what is expected to be the largest future construction market in the world - China. ....The U.S. House of Representatives has approved a vote that gives China permanent normal trading status. EDX - Were You There? On June 1-3, the Equipment Demonstration Exposition was held in Louisville, Kentucky. We had the pleasure of displaying our Extendable Paw at the Hyundai demonstration site. We enjoyed showing participants how to use our product. Hopefully you had the chance to try it out! Can you find us in the above picture? PWCE was one of many companies displaying their products at the show. Thanks to Hyundai, we were able to demonstrate our Extendable Paw on one of many of their mini-excavators. Ingersoll-Rand announced the acquisition of Neal Manufacturing, a road paving machine manufacturer. Neal will become part of Ingersoll-Rand's newly established global growth markets. Case Corporation marked another entry into the construction equipment record book with the completion of its 100,000th 1800 Series skid steer. Caterpillar has acquired Bitelli S.p.A., a European manufacturer of asphalt pavers and other road construction equipment. The acquisition enhances Caterpillar's commitment to the worldwide paving industry. Customized Products for Your Construction Needs! Lowe's Companies Inc. and NationsRent Inc. announce a partnership to operate NationsRent stores within select Lowe's stores. Need to reference a past issue of the News Break? Click Here. RiskNetWorldwide.com * An internet safety management solution provider. Libertyconstruction.com * Online community allows users to learn the latest on construction industry risk management. Every year, accidents on construction joob sites result in property damage, injuries and loss of life. In 1999 alone, more than 1,200 workers were killed, a 25% increase since 1992. In order to prevent potential lawsuits and other repercussions from negative publicity, a protocol should be established for handling the media following a crisis. The following are some guidelines. While the primary goal of any construction manager is to prevent accidents for happening, eliminating all potential risks is impossible. That's why an emergency plan is critical to both the safety of employees and to the continued viability of your company. 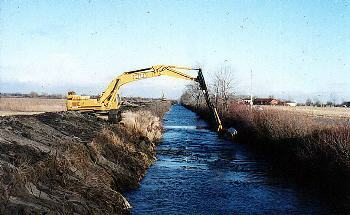 ....As with any waterway, drainage canals also need to be dredged to remove a buildup of silt that will slow the water flow. ....Recently, an Indiana-based company needed a machine that could dredge from the canal bottom all the way up the embankment. 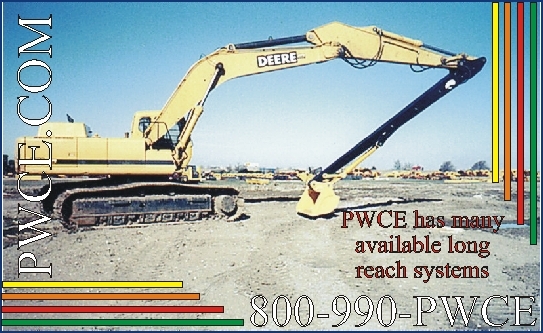 With the help of a John Deere 450 from Martin Equipment and a 3rd Stick from PWCE, the company accomplished its goal. 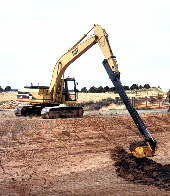 ....The Machine was equipped with a 20' 3rd Stick attachment, a dipper lockout, and a 10' wide dredge bucket. For more information on any of these products, contact us at 1-800-990-7923 or E-mail Paul Imm - Regional Sales. Copyright � 2000 Paul Wever Construction Equipment Co., Inc./Paul Wever. All rights reserved.